Southern Utah is full of spectacular sights and vistas. The unique landscape and unspoiled habitat that is characteristic of the area makes it a great place to enjoy some amazing points of natural beauty. Bryce Canyon Inspiration Point is one awe-inducing point that will leave you and your family feeling uplifted and rejuvenated. Enjoy this gorgeous view the next time you visit Southern Utah for your family vacation. When you’re ready to go witness the beauty of Bryce Canyon Inspiration Point, make sure you have a copy of our complimentary Southern Utah Vacation Guide by your side. It’s full of ways to get outside, enjoy the scenery, and have a little fun as a family. There are so many ways to bond with your loved ones while you’re here in Utah, and the Vacation Guide lets you access all of it in one handy document! 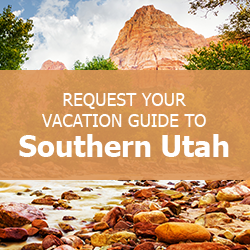 Check it out, and begin planning your ultimate Southern Utah family trip today! Bryce Canyon Inspiration Point is one of the most beautiful parts of the national park. While you’re there, take your time looking out over the main amphitheater. There are three different levels to the lookout at Inspiration Point, giving you the chance to take in three different perspectives of this awesome vista. As you look toward the Silent City, you’ll see hundreds of hoodoos. These majestic, elongated rock formations stand in intricate formations throughout the basin. Set against the backdrop of Boat Mesa, they are breathtaking. Make sure you bring your cameras – you’ll want to remember this sight! Chances are that if you’ve never been to Bryce Canyon Inspiration Point before, you may not know what a hoodoo is. Here’s a quick rundown of how a hoodoo is formed, and how Inspiration Point became so inspiring! 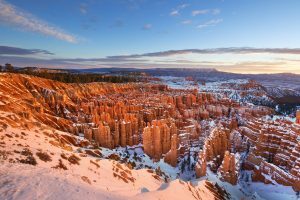 There are two kinds of erosion that turn solid limestone plateaus into the hoodoos you’ll see at Bryce Canyon: frost wedging and acidic rainwater. Frost wedging operates much the same way that potholes form in the street. During the winter, water seeps into cracks in the rock and expands as it freezes. This chips off the limestone, bit by bit. Acid rain wears away at the limestone over time, softening the edges of the pillars and giving them their characteristic bulgy appearance. Nature is quite poetic. The same processes that carved hundreds of hoodoos out of solid rock will be the ones that dissolve them completely. Since they won’t be here forever, make sure you take the chance to enjoy them while they are! Looking out over the hoodoos at Bryce Canyon Inspiration Point is a breathtaking experience. Afterward, you may want to take it easy and let the experience sink in. If you’re looking for a comfortable place to come relax, one of our gorgeous vacation homes is the perfect solution! Our properties are inviting and spacious enough for your whole family to settle in, spread out, and enjoy spending some much-needed family time together. Filled with amenities, Family Time Vacation Rentals have everything you need to relax after a stimulating day outdoors. Contact us today! We look forward to helping you make memories during your next family getaway!